We've all had that feeling after going broke early in a tournament; the feeling that we wish we could buy more chips and try again. Well in a rebuy tournament that's exactly what you get to do. Typically for the first hour in most rebuy tournaments you can buy more chips anytime you are at or below the amount that you started with. 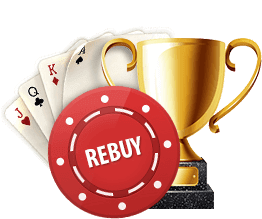 Some tournaments have unlimited rebuys, some have a fixed number and most give you one last chance to buy more chips at the end of the rebuy period no matter how many chips you have via an add on. In the same way there are different attacks in chess and different offensive and defensive schemes in football there are several overall approaches to rebuy poker tournaments. They all have pros and cons and it's important to choose the one that's right for you. In unlimited rebuy tournaments one strategy is to play almost every hand very aggressively during the rebuy period in an effort to accumulate as many chips as possible so you'll have a nice sized stack when the rebuy period ends. Players who use this strategy often play 80%-100% of hands before the flop, raising and reraising until all of their chips are in the pot. Their goal is to either pick up a real hand eventually or get lucky with a weak one. The main benefit of this strategy is /usually/ you'll end up with a bigger stack at the end of the rebuy period than if you played a more traditional style, thus giving yourself the best chance to make the final table or even win the tournament. Players who use this plan of attack are willing to pay for the extra rebuys and take the extra risk in the hopes of hitting it big. Daniel Negreanu is famous for using this strategy and during an event in the 2006 WSOP he made forty eight $1,000 rebuys! Of course we don't all have ten million dollar bankrolls with only outright victory on our minds. In theory the Super Loose Strategy sounds good, but in practice it's not profitable for almost all players who try it. Those rebuys aren't free and there will be times when you rebuy and rebuy and rebuy and end up with nothing to show for it. Even if you do manage to generate a huge stack, that's no guarantee that you're going to go deep in the tournament (which will often be required for you to just get even) or even make the money at all. If you want to use this strategy (maybe you've made a large last longer bet with another player or you're playing for the thrill of victory and the money involved is secondary) making a few small adjustments can go a long way. First of all, don't play /every/ hand. Give yourself a chance to play a little bit, make some decisions, and get away from the hands where you have virtually no chance. Throwing away those total garbage hands like 7-3 and 8-5 can reduce the number of rebuys you'll need to make. Secondly, even if you're in almost every hand there's no reason to make massive overbets. With 200 in the pot there's no reason to go all in for 2,000 when you can bet 200. Against three people who've limped in for 30 it's fine to raise it to 150 or 200 instead of sending in all of your chips. Give yourself a chance to play a little bit, make some decisions, and get away from the hands where you have virtually no chance. One small secondary benefit of this strategy is that it's fun. Getting in there and mixing it up with a ton of hands can be a nice change of pace and if you hit a run of good cards you should end up with a ton of chips. The best thing to do if you're curious about this strategy is to try it out in a very small online rebuy tournament. A much better strategy is to play more hands than you normally would during the rebuy period and take a few more calculated risks, but keep things under control. It makes sense to loosen your starting requirements especially in late position and especially when you can get in for one bet. Along the same lines you should defend your blinds against small raises with many more hands than you normally would. The reason why these changes are profitable is that your opponents will be much more willing to risk all of their chips if they catch any piece of the flop since they know they can just buy more. As a result, if you make a big hand you're much more likely to get paid off. Those few extra chips you risk before the flop are worth it to give yourself a chance to win a big pot. And if you do run out or start running low on chips you can buy more. While the Super Loose Strategy might require that you make 20+ rebuys, the Slightly Loose Strategy will normally work with 2-5 rebuys. Another strategy normally used by players who are working with a short bankroll is the One Bullet Strategy. While most players are willing to use at least a few rebuys, some players will buy in, ignore the rebuy aspect completely and give up if they go broke. Some people think this approach is a waste of time and money and that these players have no chance. This is certainly not true, but there is a tradeoff involved. Playing against players who are almost all willing to rebuy multiple times means you'll be at a major chip disadvantage. But, if your one bullet hits the target the payoff will be much larger compared to your investment. If you decide to go with the One Bullet Strategy patience is paramount. It's important not to get involved the first time you suspect you have a small edge. In all likelihood you'll get action when you find a solid hand and there's no reason to risk all of your chips before the flop in the first few hands with something like A-2 or K-J even if you're up against a player who you know is getting out of line. If you're playing online, you should be able to look at 60 hands or so in the first hour while everyone is still playing loose and the blinds are relatively small. When deciding whether or not you want to commit all of your chips on a given hand, ask yourself if you're likely to find a better spot a few hands down the road where you're a little more sure about your chances. Of course you don't want to take it too far and start throwing away strong hands, but there's no reason to settle for getting your money in when you're a small favorite when you could wait and maybe get you're money in as a big favorite. If poker tournaments were roulette using the Super Loose Strategy would be like making a big bet on red or black, the Slightly Loose Strategy would be like making a medium sized bet on a group of 6 numbers and the One Bullet Strategy would be like making a bet on an individual number. A slight variation on the One Bullet Strategy is the Three Bullet Strategy. Instead of limiting yourself to just the initial buy in, another approach is to immediately take a rebuy and then play those chips as long as you can. If you go broke give up and if you make it to the add on period take the add on and go from there. With those extra chips you won't be so short stacked compared to the competition, but you won't empty your pockets if you hit a bad run of cards. If poker tournaments were roulette using the Super Loose Strategy would be like making a big bet on red or black, the Slightly Loose Strategy would be like making a medium sized bet on a group of 6 numbers and the One Bullet Strategy would be like making a bet on an individual number. In my opinion, I think the best thing to do is play solid, but a little looser than normal and buy as many chips as they will let you. This means rebuy as soon as you sit down, if you go broke rebuy (usually you can do two rebuys at the same time if you go broke) and do the add on. Once you make it through the rebuy period use your normal tournament strategy and grind those other suckers into dust! One hurdle that you'll have to jump in almost all rebuy tournaments is players making massive over bets when they move all in before the flop and to a lesser extent on the flop. It's not rare in the smaller rebuy tournaments to see some players move all in for thousands of chips when there are very few chips in the pot. These players are using the Super Loose Strategy and while they're usually not doing themselves any favors, if you're not getting good cards they can make it tough on you. It becomes difficult or impossible to put these players on a hand and you'll find yourself getting involved in pots where your opponent could have just about anything. You're best bet against this type of player is to wait for a good hand, get your chips in there and cross your fingers. What you don't want to do is get frustrated by your opponents moving all in left and right and start calling them down with hands that are below average. In the most extreme case where you are willing to do as many rebuys as you need to and you have an opponent who is moving in literally every hand you should get involved with any hand that is above average. The following hands are between 52% and 55% to win against two random cards: (pairs) 33, (suited hands) K4-K2, Q7-Q5, J8, T9, (unsuited hands) A2, K6-K4, Q9, Q8, JT, J9. If you're not willing to rebuy more than a few times or you have a player who's going all in frequently, but not every pot, you need to be more selective. Stay patient and at least wait for a pair, an ace or a king with a big kicker if you're going to commit all of your chips before the flop against one of these super loose players. Another thing to consider is limping in with a big hand if you find yourself acting before a player using the Super Loose Strategy. If someone seems to be raising every hand, when you get a big pair or a big ace, give them some rope to hang themselves with. In rebuy tournaments you'll find yourself going all in and calling all ins much more frequently that you would in a standard tournament. One big mistake many players make is calling down all ins against loose opponents with any ace or any pair when the difference between seemingly similar hands is drastic. Take the comparison between 22 and 55 for example. Both are small pairs, they'll be small favorites against most hands that contain two over cards (they'll be a little behind against hands like J-T suited and Q-J suited) and certainly neither is an earth shatteringly good hand. But with 22 you'll never be a big favorite against a hand unless it contains one of the other two deuces. On the other hand, with 55 if you're opponent has any one of 14 cards (4 twos, 4 threes, 4 fours, and 2 fives) you'll be at least a 2 to1 favorite. Every time you're pair goes up another notch it adds 4 cards to the list of candidates that you'd love to see in you're opponent's hand. At the end of the rebuy period in most rebuy tournaments you can buy more chips regardless of the number in your stack. To sweeten the deal, normally the add-on comes with 25%-50% more chips than a normal rebuy. While it almost always makes sense to take the add-on, taking it every time isn't optimal. When making the decision about taking the add-on or not, the factors to think about are your stack size and how much those extra chips are going to help your chances. If you've hit the monster rush of all time, you've got 200,000 chips and the add-on is only going to add 2,000 chips to your stack then you're better off saving your money. On the other end of the spectrum if you have 3,000 chips and you can put another 2,000 on it, clearly those chips are going to have a big impact on your chances. In general, taking the add-on is a good idea. Those extra chips will have a multiplied effect every time you double up (in other words, if you add a 2000 chip add on to your 8,000 chips stack you'll end up with 20,000 chips if you double up instead of 16,000, and you'll have 40,000 if you double up again instead of 32,000) and could be the difference between going broke and surviving. While it might seem like the difference between totally broke and short stacked isn't that significant, it's actually huge. You're never out of it until you have zero chips and I'm sure any regular tournament player you ask will have a story about how they came back from the brink of elimination to make the money or even win a tournament. In a normal rebuy tournament there is a big pot of gold at the end of the rainbow that frequently justifies making quite a few rebuys. On the other hand, in rebuy satellites the maximum potential win is much smaller in relation to the size of the buy in and the rebuys. As a result you should play slightly tighter and plan on taking fewer rebuys than you normally would in a regular rebuy tournament. You should look at the value of the seat you're trying to win in relation to the cost of the rebuys when you're deciding how loose and aggressive you want to be. After all it doesn't make much sense to spend money on five or six rebuys for a chance to win a seat that's only worth the value of 10 rebuys. But if you find yourself in a tournament where you're playing for a $10,000 seat and the rebuys only cost $30 then taking more risks (which will frequently lead to more rebuys) is justified. Another mistake some players make in rebuy satellites is playing too many hands when they've got the seat virtually locked up. Some players feel like it's their duty to go after the short stacks when they have a huge lead. While it a regular tournament with different payouts for different places that's exactly what you want to do, it doesn't make any sense in satellites. When all of the top finishers get the same prize and you have enough chips to cruise into victory lane, why would you put any chips at risk that you don't have to even if you have a monster hand? Just be patient. Those short stacks will bust each other eventually and you'll end up with the same amount of money.